Case length is 39mm. Case head diameter is .445″. Case capacity is 35.0 grains of water and about 32.5 grains powder. 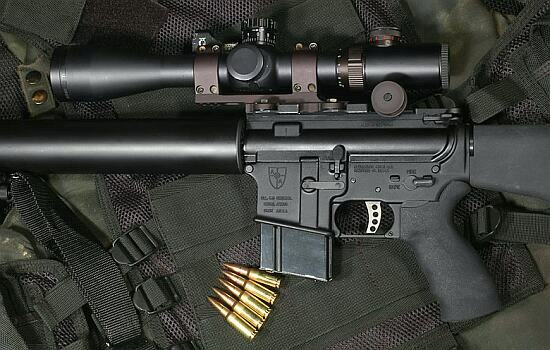 The cartridge was developed to maximize performance in the AR15 platform. In that role, magazine-length loads are limited to 2.255″ OAL. However, in single-round loading or in a bolt-action rifle, OAL can be extended with bullets up to 130 grains as far as 2.420″. While .223-chambered AR15s shooting VLDs performed well out to 600 yards and beyond, this was not an ideal solution. Given a choice of platform, top cross-course competitors favored other cartridges such as the 6mm BR Norma, 6mmXC, and .260 Remington in rifles such as the Tubb 2000, “Tube Guns” or the Armalite AR10. I wanted to develop a better round that would still work with the AR15 platform. I looked to the PPC family of cases for the answer, since the PPC is considered the most accurate case design ever invented. The 22 PPC would drive the 80gr bullets needed for 600 yards in a mag-friendly length. However, I didn’t feel the 22 PPC using 80gr bullets would provide the competitive edge I was seeking nor would it perform well for hunting. In contrast to the 22 PPC, the 6PPC was able to do both jobs (competition and hunting) by using 105gr Bergers or 107gr SMKs for competition and 85-100 grain Nosler Partitions for hunting. But one thing still bothered me about the 6PPC. The 2.255″ max mag length meant I had to seat the 105-107 grain bullets way back in the case, or I had to modify the mags. Notching magazines had zero appeal so before going further with the 6 PPC, I decided to think “out of the box”. I knew that Sierra made a 6.5mm 107gr Match King and Lapua made a 6.5mm 108gr Scenar. Given their larger diameter, these bullets were actually shorter than their 6mm counterparts. So, I could use these 6.5mm bullets without seating bullets back in the case or notching magazines. Then, I found that Lapua’s 123gr 6.5mm Scenar matched the BC of Sierra’s 107gr 6mm MatchKing yet it was no longer than the 108gr Scenar! Bingo–by moving up to 6.5mm, I could equal 6PPC ballistics with a 107gr Sierra without modifying mags or seating the bullet too deep in the case. In addition, 6.5mm was a proven game caliber with many good 100-125gr controlled expansion hunting bullets available. As load development and testing continued, I discovered the 6.5 PPC was very effective and accurate using medium weight 6.5 mm bullets. My initial goal of achieving 2650 fps was surpassed as I developed loads using moly-coated Cauteruccio 128-grain bullets achieving 2750-2800 fps. I’ve tried a variety of powders, and right now Vihtavuori N530 is the most promising in terms of velocity, but I’m convinced the cartridge will perform well with a variety of propellants. 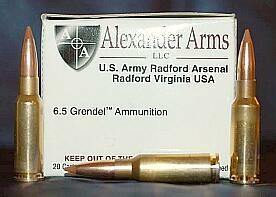 Alexander Arms now offers 6.5 Grendel ammunition in Lapua brass, loaded to AR15 mag length with a choice of three different premium bullets. Alexander uses readily-available powders so hand-loaders can duplicate the recipes. Arne tells us: “Having shot thousands of rounds in developing the 6.5 Grendel cartridge (and in testing 6.5 PPCs), we had a good idea of what would work in the bolt gun–Vihtavuori N530 and Western TAC. Both these powders have load densities, kernel sizes, and burn rates that work well with the Grendel case. Though we’re still early in the load development process for the F-Classer, our load of Vihtavuori N530 with Fed 205M primers and moly’d JLK 130s produces consistent 2760 fps velocities from a 28” barrel. This load is grouping well, even though it took some time for us to get used to that 2-ounce Jewell trigger! (To an AR15 shooter, one pound is a “light” trigger pull). The N530 and JLK 130gr VLD load produced 6″-7″ witnessed five-shot groups at 1,000 yards. The amount of drop at 1000 yards surprised us–an even 30 MOA of adjustment (from a 100-yard zero) got us on target at 1000. That’s nearly dead-even with a 6BR shooting a 107gr Sierra MK at 2900 fps. That means, at very long-range, the superior BC of the 6.5mm JLK made up for the lower initial velocity of the Grendel. With the great performance of the 6BR, and the availability of larger 6.5mm cartridges such as the Rem 260 (6.5-08), one can ask “what is the advantage of the 6.5 Grendel”? The answer is three-fold: size (form factor), efficiency, and BC. The Grendel will fit in an AR15 platform. The Rem 260 will not. 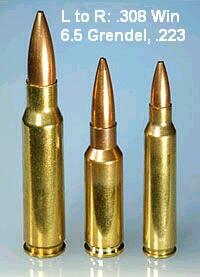 The Grendel can push a 130gr bullet to 2760 fps with 15 grains less powder than a Rem 260. Burning less powder reduces recoil, and signficantly extends barrel life. 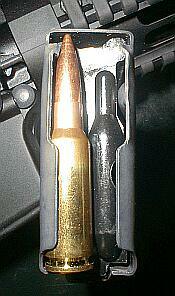 In a bolt gun, the 6.5 Grendel can push the 130gr JLK (loaded long) to 2760 fps. Comparing the ballistics with a 6BR shooting a 105gr Scenar at 2850 fps, the Grendel has just 3″ more drop at 600 yards (102.9″ vs. 100.2″), and, surprisingly, the Grendel bucks the wind better. With a 10 mph crosswind, the Grendel’s 130 JLK drifts 20.9″ at 600 yards, while the 105 Scenar drifts 23.8″, based on PointBlank software calculations. So, with the 6.5 Grendel, you get performance very similar to a 6BR, with the benefit of a heavier bullet that may work better on knockdown targets. Silhouette shooters have favored 6.5mm cartridges over 6mm variants because, no matter what the computers say, the larger diameter bullets just seem to smack the silhouettes more reliably than the 6mms. This may be a function of bullet cross-section as much as terminal energy–the fatter the bullet the more it tends to transfer energy to the target rather than penetrate or shatter. By the numbers, a 105gr 6mm Scenar launched with 2850 muzzle velocity (MV) retains 870 ft/lbs energy at 600 yards. The 130gr JLK with 2760 MV has 1130 ft/lbs of retained energy at 600 yards–29% more than the 105gr Scenar. Silhouette shooters, have we got your attention yet? high-quality Lapua brass AND factory-loaded ammo. Optimized for the AR platform, 6.5 Grendel ammunition from Alexander Arms operates at a safe and sane 49,000 psi. Using the excellent 123gr Lapua Scenar bullet (.542 BC), the loaded ammo will run 2670 fps from a 26″ barrel, and will feed reliably from a magazine. Custom 10- and 17-round 6.5 Grendel AR magazines are available for $27.00 from CompetitionShootingSports.com. Current factory-loaded Alexander Arms cartridges are shown in the photo. Left to right: 129gr Hornady SST, 123gr Lapua Scenar, 120gr Nosler Ballistic Tip. Ballistics for Alexander Arms’ factory-loaded ammo have not yet been released. However, I’ve produced a detailed ballistics chart for the 6.5 Grendel with 108gr, 123gr and 144gr bullets. 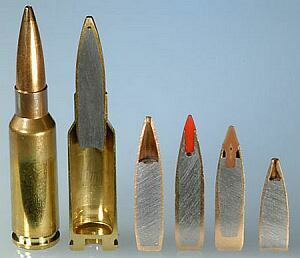 It includes the .223 Rem, 6.8 SPC and 7.62×51 NATO (.308) for comparison. Click to download .pdf format Ballistics Chart. 6.5 Grendel for Hunting and Long-Range Shooting in the AR15 Platform Run the ballistics and you’ll see why the 6.5 Grendel is finding favor with so many AR15 shooters. 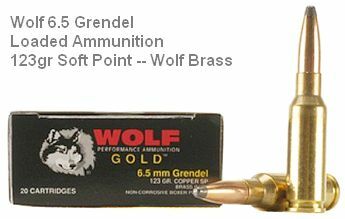 The Grendel cartridge offers a high-BC projectile in a normal magazine-length format. Feeding is reliable with the dedicated Grendel mags now being produced. The 6.5 Grendel transforms the AR as a hunting rifle, allowing it to shoot very effective polymer tipped and controlled-expansion bullets up to 125 grains. An AR15 for white-tails? You bet. The Sierra 120gr Pro-Hunter SPT or Nosler 125gr Partition will perform admirably at the velocities allowed by the 6.5 Grendel. In summary, the 6.5 Grendel was developed to take the AR15 to a new level giving it the long-range capability of the M14 and 7.62 NATO cartridge as well as making for a mild-recoiling hunting cartridge suitable for many North American game animals. In competition, I believe it is only a matter of time until more shooters use the 6.5 Grendel to improve their standings. One customer, who recently used both the 6.5 Grendel in an AR15 and the 6XC in a Tubb 2000, posted virtually identical scores in the same match with both rifles/cartridges. When asked if he could have equaled his Tubb 2000/6XC score with his AR15 .223 rifle, his simple response was “no way”. In the bolt gun sports, the 6.5 Grendel has received interest from a variety of disciplines including F-Class, Tactical, Benchrest and Silhouette. Silhouette shooters are especially pleased with the availability of factory ammo in sufficient quantity to make the cartridge legal for Hunter Class Silhouette. In the Benchrest arena, Dr. Palmisano has started the ball rolling–getting some top bullet-makers working on new, light 6.5mm flat-base bullets. Everything you need for a 6.5 Grendel project is available from Competition Shooting Sports (CSS), (281) 330-0352 in Houston, TX. This includes brass, bullets, magazines, complete AR15 uppers, and loaded 6.5 Grendel ammunition from Alexander Arms.The complete SG&Y F-Class rifle is also sold by CSS for $3850 without optics, chambered for 6.5 Grendel. A variety of other chamberings are available. 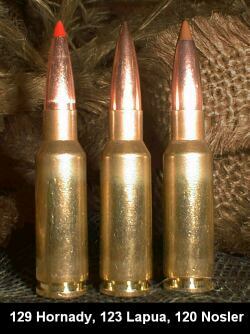 For more information on the 6.5 Grendel cartridge, visit www.65Grendel.com. The cartridge is going through the CIP process and the detailed max specifications will be released at that time. These maximum specifications are in excess of the loads used in factory ammo for the AR15 due to bolt thrust limitations of the locking lug system. I have known Bill Alexander for many years and one thing he is safe and with hundreds upon hundreds of Grendel’s out shooting without any failure, I would I say the proof is in the hand of shooters. When the cartridge is CIP’d, a standard chamber specification will be in the public domain and people will then start tweaking the clearances and throats for their purposes. I have my own clearances [for a match reamer] as does Speedy Gonzalez. Robert Whitley has his necked-down version he calls the 6mmAR. Currently, for a variety of reasons, I have no plans to release the detailed dimensions of the match chamber I use nor will I authorize the reamer maker to sell the reamer to the public. day. You cann’t believe simply how so much time I had spent for this information! Thank you! someone with a few original thoughts on this topic. in writing this website. I really hope to view the same high-grade content from you in the future as well. in time i am reading this impressive educational paragraph here at my home.